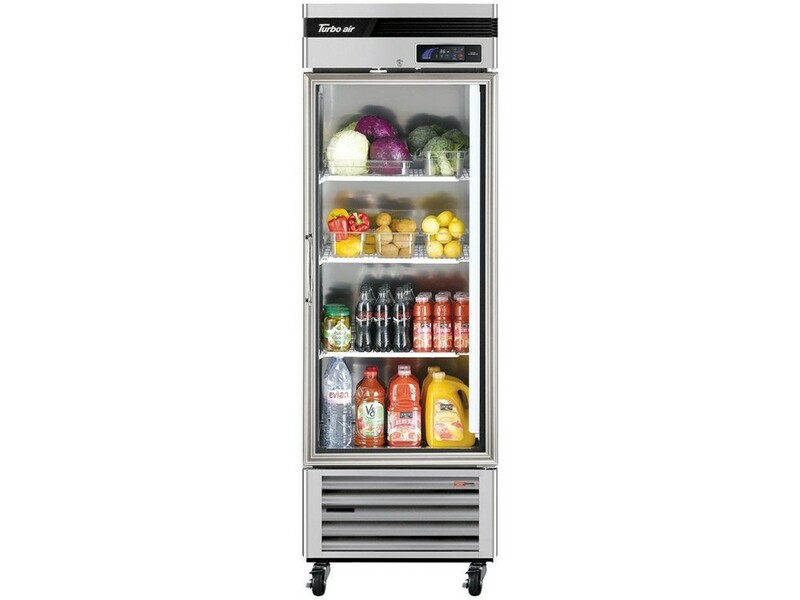 Turbo Air TSR-23GSD-N6 Super Deluxe Series 27" Glass Door Reach-in Refrigerator | Brittania Food Equipment Ltd. The Turbo Air Super Deluxe glass door model is constructed with stainless steel exterior. The door is glass with AL frame. The interior is stainless steel that guarantees the utmost in cleanliness and long product life. The Super Deluxe adds a touch of style to the most refined setting. Energy saving double pane glass doors are equipped with Low-emissivity glass, which reduces outer heat gain and decreases energy consumption. It enhances energy efficiency and minimizes condensation. Lightweight door construction also reduces door maintenance and bushing wear, which in turn facilitates smoother door opening. Customers' fatigue fades away with easy grip handles and doors that open effortlessly. Self-closing features make this the ultimate choice in customer convenience.